Signals of Spring is pleased to add the moose to the list of species that students can track by satellite! Collaborating scientist and U.S. Fish and Wildlife biologist, Mrs. Gail Collins at the Tetlin National Wildlife Refuge in Alaska, is currently tracking five adult cow moose using satellite collars. She tracks 15 other cow moose using collars that send radio signals. Mrs. Collins locates these moose once every month from a small airplane. All twenty moose were captured by shooting a tranquilizer dart at them from a helicopter. 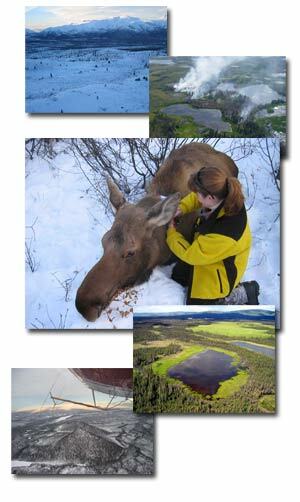 Mrs. Collins studies the movement of moose within the over 900,000 acre Tetlin National Wildlife Refuge and surrounding lands. She is also interested in their reproduction, survival, and response to changes in the habitat. Mrs. Collins specifically studies the effect that natural fires have on the movement and habitat use of moose. Wildfires are a natural and necessary part of interior Alaskan ecosystems. Many wildlife species are dependent upon new vegetation and habitat that occur as the result of fire. The severity of a fire (how hot it burns) may determine how quickly after a fire the habitat becomes suitable for moose. During the winter, moose depend on the twigs of woody shrubs as food, which are often the first to regrow in burned areas. During 2003 and 2004, several large fires burned on or near the Tetlin National Wildlife Refuge. Mrs. Collins is tracking how the moose use areas following fire; some of the marked moose are already using the area that burned in 2003. Another research question Mrs. Collins is working on is the relationship between temperature and the movement of moose. Interior Alaskan winters bring air temperatures to minus 60 degrees with deep snow. Satellite data may help scientists understand how moose respond and survive in such extreme temperatures. Signals of Spring students can follow along with this research by viewing weather data on the new interactive maps. Native and rural Alaskans living in and around the Tetlin National Wildlife Refuge, approximately 2,000 people, rely upon moose as an important food source and to maintain their subsistence lifestyle. The Refuge is charged with both conserving wildlife and providing the opportunity for subsistence hunting. The most recent moose count estimated the population density at approximately 0.4 moose per square mile. Mrs. Collins research and outreach efforts will help ensure that this moose population continues to be stable and healthy for many generations to come. This research was made possible through grants provided by the Tok Lions Club, the Alaska Gateway School District, and the U.S. Fish and Wildlife Service in cooperation with the Alaska Department of Fish and Game. Keep an eye on Mrs. Collins exciting work as she tracks cow moose through the Tetlin National Wildlife Refuge.